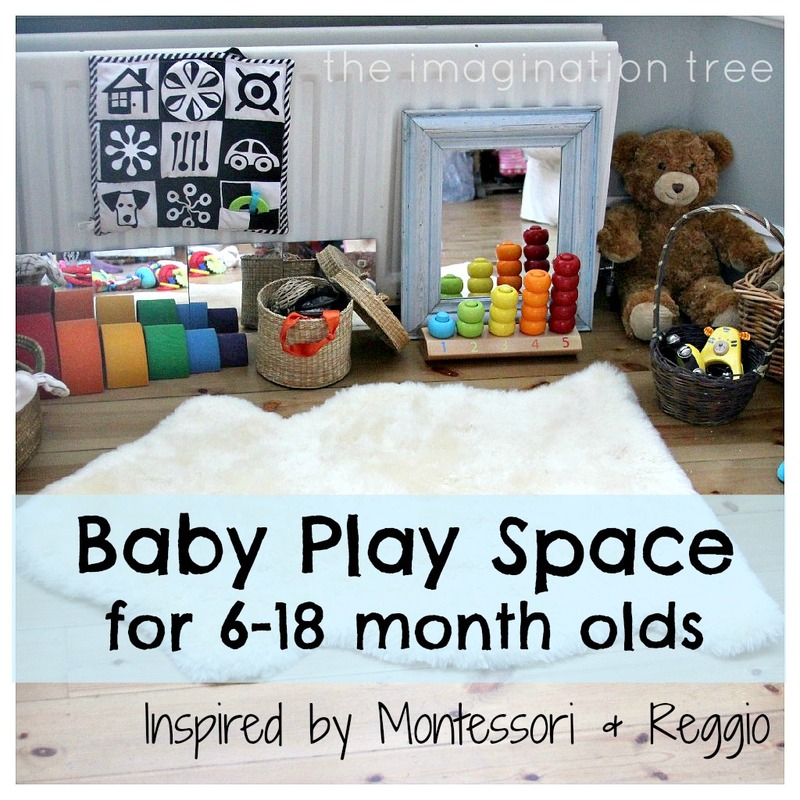 Create a simple yet stimulating baby play area using open-ended toys made from natural materials and incorporating some philosophies from Montessori and Reggio thinking. 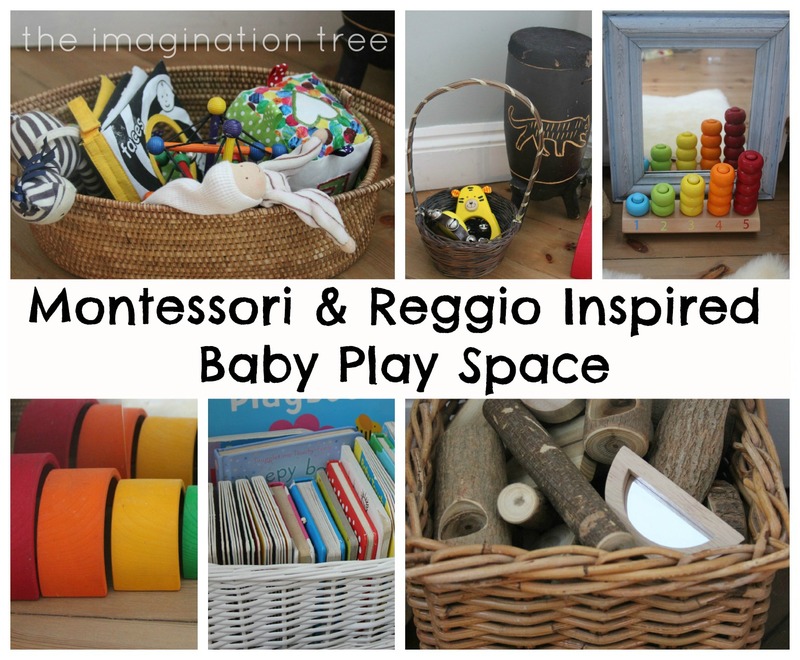 When baby Bean was newborn we put together a baby play space based on Reggio ideas of simplicity, light and real materials, and that included no plastic toys or electronic gizmos. Now that she is sitting up, crawling and pulling up to stand already (please slow down baby girl!) her play space has moved to a safe area on the floor with a few new additions, and both she and her sisters love playing in it. In a little corner of the room we laid a lambskin rug (which keeps baby warm in winter and cool in summer) and a few treasure baskets and open-ended toys within easy reach. 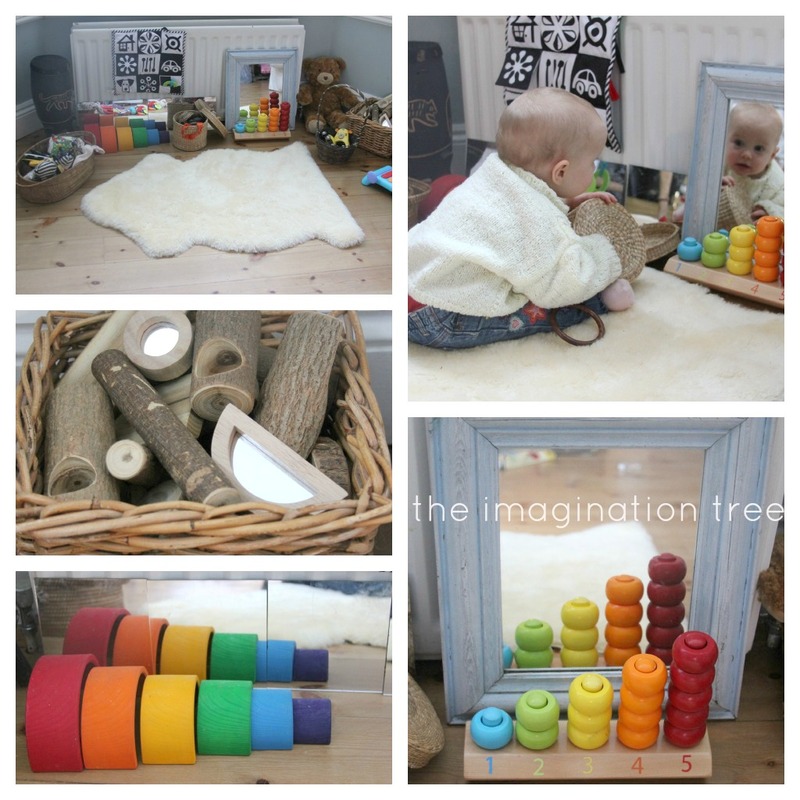 Reggio philosophies talk highly of including plenty of mirrors and natural light, so we used some acrylic mirror tiles behind some toys and a large stand up mirror which can be moved and repositioned. These are pretty much the only toys that she has now, after I cleared out 4 large boxes worth of plastic, brightly coloured, electronic nonsense a few weeks back! She is very happy with these items and plays mainly with real objects anyway, hence reiterating the good common sense behind the heuristic play argument. You can read more about that in my first post about treasure baskets here. * Edited to add: we are not at all anti plastic toys or materials! We have plenty in our house but I wanted to start with the baby toys that really served only one function and were not promoting much thinking or curiosity. They were easy to donate to others. The rest of the clutter is not so simple to sort and shift! We absolutely adore Playmobil, lego and duplo and of course they are all made from plastic, so the emphasis was more on the type of toy, rather than what it was made from. The girls have really been enjoying playing here together in this new space and the lambskin rug has become a favourite spot for reading together. I look forward to seeing how the space evolves over the next few months! Do you have any play spaces in your home? Please share your ideas! « Easy Sparkler Treats for Bonfire Night or New Years! Well done for sorting out, and getting rid of the Plastique and the Bleepy! I visited a friend yesterday whose 12-month-old was obsessed with some large paint tins they had stored in a corner of the kitchen. Because they were heavy with paint they were stable, irresistible due to the sturdy plastic handles, and the lids(impossible to remove)made them the perfect drum-kit. It was so lovely to see him stay put for a bit and play so brilliantly with them. LOVE how the best toys often come from the most unexpected things! Totally agreed! What a lovely play time you witnessed! Oh this looks so lovely. i wish i’d been blogging when mine were babies. i really struggled with fun activities at this age. thanks Rebecca! I wish I’d done these things when my eldest was young too! acrylic mirror tiles– where did you find those? This is fantastic! I’m pinning it. This looks lovely! I would love to recreate this in my home. Where did you get your tree blocks and mirror blocks? Links to where such toys can be purchased would be a great help. I’ve added the links now, thanks! Lovely. I am in the process of reorganizing my home and throwing out as much plastic as I can too. This is such a lovely idea, very inspiring! I recently cleared out our kitchen closet & made a kitchen playspace for my 2 year old. We have a wood play kitchen & a small storage unit. It’s very simple but ever since I did it, my daughter has been playing in it constantly. Amazing how simplicity changes everything! Can you please provide links to each toy that are in the pictures when you find a few minutes? I too would very much appreciate links to each toy you mentioned in the post. This is wonderful and I would like to incorporate some of it with my 9 month old! As with the treasure baskets, does this kind of area need to be brought out periodically so the baby doesn’t get bored of it, or can it be a permanent fixture? Wonderful post! Have pinned to my 0-18 months old board. I love this post too…it reminds me of my nursery! Did you see the article today about Slow Toys Movement in most newspapers? I thought you would like it! 18month olds?! No no no, push the baby aside and LET ME PLAY! That looks so lovely and inviting! And aren’t mirrors just the best baby play thing. Beautiful post, you have such wonderful ideas and inspirations. Love this site! Some people think they need to buy plastic toys/noisy toys for their children but learning opportunities from them are very limited were as activities like this gives endless learning opportunities for children. They are so cheap to do but often they are more engaging. Plastic toys are so boring and most play repetitive tunes.Keep up the great work! Welcome to Revoluza, a network that combines the addictive adult entertainment industry with the lucrative online business world. Backed by an effective direct selling marketing strategy, Revoluza offers you an opportunity to make money while managing and promoting your own Tube-Site. By attracting an online audience and recruiting new members into the network, you have the potential to make thousands in monthly revenue. Explore the rest of the site to learn more about joining Revoluza, an unstoppable online community. Revolua Registration By Revoluza Network . Love your blog!! I have done several of your activities with my children and they have loved them as well. Very accessible even for a non-crafty person such as myself. Could you please let me know where you got your play logs from or how you made them? I sort of did things like this without even realising that this is what I had done… thanks for the post, really enjoyed looking through it. Could you post some play areas for kids that are past 18 months too, I have a 14 month old and wanting to see what would be appropriate for older kids, thanks!